As a kid of the early 80’s, I wasn’t introduced to a home video game console till around 1988 or 1989. I knew what they were, friends had them and I would play them when I went over to their houses. My brother owned an Atari but lived hundreds of miles away and I only got to play it maybe once a year and my parents really didn’t want to spend the money on one for me. Most of my gaming came in the form of the arcade. Living in a rural community, we didn’t have a local arcade. There would a Pac-man or Space Invader machine at the Pizza Hut and the movie theater and bowling alley would have a few. We would have an arcade one week a year in town and that was during fair week. Once school was out in June I would start saving my weekly allowance knowing that in a few weeks the fair would be in town and I would need all the quarters I could get. There was an arcade in the mall about 50 miles away, but back then we only went two or three times a year. You went for Christmas or back to school shopping, never to just waste the day. It was a treat. I remember the Golden Mine Arcade. It was down a long hall that was kind of an empty wing where the offices were. There was it and maybe one other store across the way. It was a huge pitch black room with the only light coming from the hundreds of lit machines and the mixed up sounds of all of them playing music and noise all at the same time. My parents would go off shopping and I would stay there the whole day. Standing in line to get my turn at the newest, hottest game. Galaga to Pac-Man then Street Fighter to Ninja Turtles in the 90’s. I wasn’t always good but it didn’t matter as long as I had fun. It’s a time long gone now that young gamers will probably never get to really experience or appreciate. 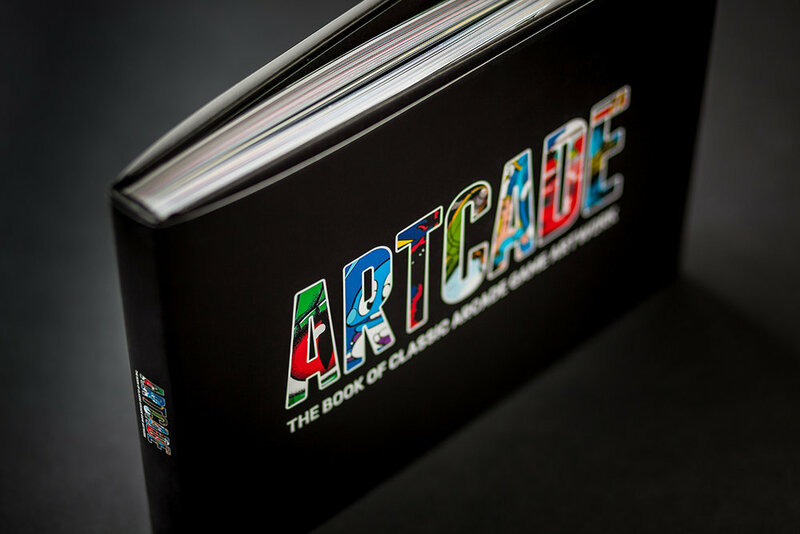 I remember back in the fall of 2013 hearing about a Kickstarter for a book called Artcade. 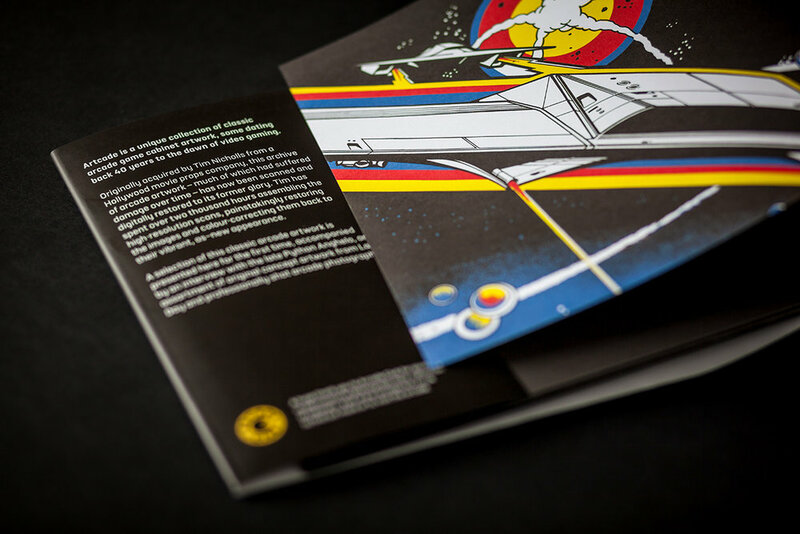 It was going to be a book of classic arcade game art. The creator of the book, Tim Nicholls, acquired a huge collection of arcade game artwork that had been collected by a Hollywood movie prop company that was closing their doors. He sold his entire game collection, including full arcade machines, to buy the collection. Most were in bad shape but with his restoration efforts he has over 4,000 high resolution from the marquee to the side art and even the control panels of arcade machines. There was no other book like this around and no one has had more passion than Tim to preserve these fantastic works of art. The Kickstarter more than doubled its goal and in 2016 the book as published. Overall the book is excellent quality. This hardcover book has art from over 120 games and is over 320 pages. The marquee art is A4 landscape that covers 2 pages (a little over 22 inches in length). The print is lithographic quality and the colors pop off the page. From 1942 to Mortal Kombat, some of the most popular games from the 70’s, 80’s and 90’s are here and they look wonderful. Just looking through the book brings back so many memories of games that I had not thought about in many years. The care and the quality put into restoration of the art shows. There is also an interview with artist Python Anghelo, who is known for his artwork for Pinball and arcade machines, as well as a section of concept art by Larry Day, who did many of the arcade cabinet artwork of the 80’s. I highly recommend this book not only to arcade fans, but pop art fans as well. If you are a gamer who is into collecting gaming history books, this one is a must have for your bookcase or coffee table. At about $30 US it is a great deal and a must have. You can get it directly from the publisher here. I know at one time Tim was selling framed prints of marquee art that any gamer would appreciate in their game room. You can contact him on Twitter @woodpunk for more info. Thanks to Bitmap Books for supplying a copy for review. The Gamers Lounge Podcast Episode 112: "Fire-Overwatch"
The Gamers Lounge Podcast Episode 111: "Lots of Games...and a Cat?"